Background: Biofilm packed bed reactors are used to enhance the lactic acid yield. The process involves the employment of Lactobacillus casei, Lacto bacillus rhamnosus, and Rhamnosusoryzae in combination on ceramic beads immobilized with Streptomyces. The reaction did not produce proper product since a fall in pH was observed with the production of lactic acid. Hence a pH gradient was observed through the interval of the reactor column. To maintain proper pH throughout reactor suitable continuous production type of reactor can be used for the lactic acid- formation. Further, lab scale procedure was compared with immobilization and without immobilization. Methods: In our work, this innovative method has been used for the enhancement of the lactic acid, which is a continuous production of lactic acid by immobilizing the mixed cultures of L. casei , L rhamnosus, and R. oryzae with ceramic beads along with the biofilm development using streptomyces viridosporus culture. The outcome has witnessed an improved productivity of the desired product when compared with lactic acid production by using pure culture which was immobilized. 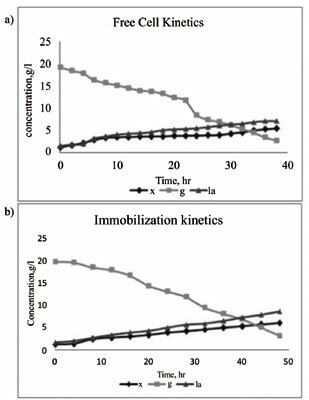 Results: Lactic acid production in a packed bed reactor has resulted in 12.4 g/l, when compared to lab scale production of 7.02 g/l and 8.1 g/l under mobilized and immobilized conditions with 20 g/l glucose. The yield/product of lactic acid covered around 4 g/1 irrespective of the sugar (carbon source) concentration. Conclusion: Therefore, the present work establishes the significance of cost effective, autoclavable biofilm based fermentation. Long-standing effectiveness of biofilm in continuous reactors designated that the biofilms are effectively maintained for the conversion of sugars (carbohydrates) to lactic acid mainly. Keywords: Anaerobic biofilm reactor, ceramic beads, lactic acid, immobilization, mixed culture, fermentation. Keywords:Anaerobic biofilm reactor, ceramic beads, lactic acid, immobilization, mixed culture, fermentation. Abstract:Background: Biofilm packed bed reactors are used to enhance the lactic acid yield. The process involves the employment of Lactobacillus casei, Lacto bacillus rhamnosus, and Rhamnosusoryzae in combination on ceramic beads immobilized with Streptomyces. The reaction did not produce proper product since a fall in pH was observed with the production of lactic acid. Hence a pH gradient was observed through the interval of the reactor column. To maintain proper pH throughout reactor suitable continuous production type of reactor can be used for the lactic acid- formation. Further, lab scale procedure was compared with immobilization and without immobilization.